Argo employees come together for a cause, collecting funds – and hair – to help sick kids, cancer patients and disadvantaged bike riders. 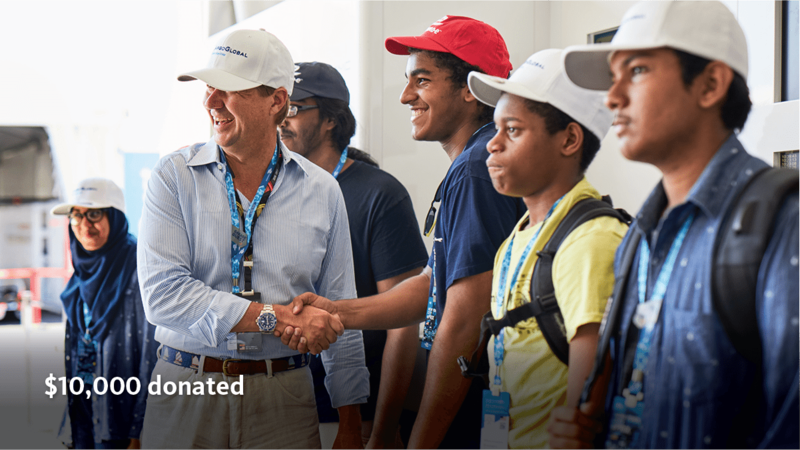 CEO Mark E. Watson III announced Argo’s $10,000 matching Power Grants Sponsorship to support STEM students from two Brooklyn robotics teams – George Westinghouse Career and Technical Education High School and Transit Tech Career and Technical Education High School. Ariel Re AVP of Claims Sophia Smethurst and her son, Cameron, shaved their heads in Bermuda to support St. Baldrick’s Foundation – an organization that funds research to find cures for childhood cancers. $14,255 raised from donations and Argo’s match. Denver employees raised money and joined the National MS Society’s Walk MS: Denver to support colleague Christine Cockwell, a Quality Control Analyst for Colony Specialty who lives with multiple sclerosis. $10,000 raised from office initiatives. Argo Group SVP of Operations Rick Artessa cycles for the Brady Faith Center’s Pedal 2 Possibilities program to serve a disadvantaged area in Syracuse, New York. After 10 rides, each participant in need receives a free bike, helmet and lock. Trident Public Risk Solutions employees in Springfield, Massachusetts, participated in Bowl For Kids’ Sake to benefit Big Brother Big Sisters of Hampden County. 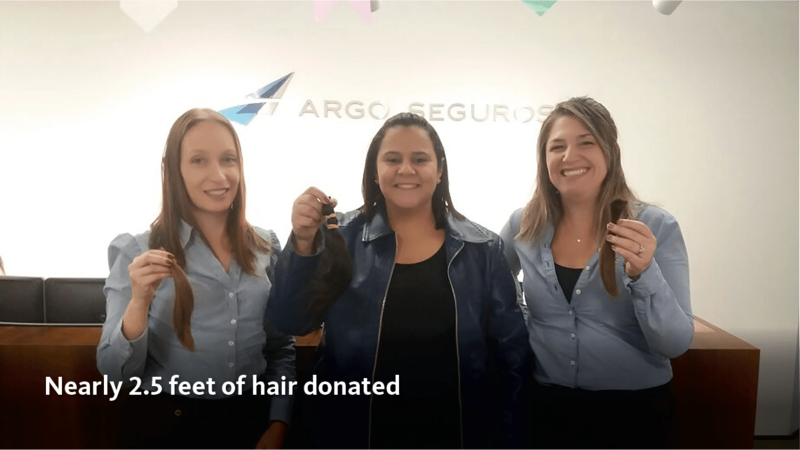 Argo Seguros employees in Brazil donated hair to Rapunzel Solidária, a nonprofit organization that creates wigs of natural hair for people of all ages who have lost their hair due to diseases such as cancer. Nearly 2.5 feet of hair donated. ArgoGlobal’s charity partner, The Sick Children’s Trust, provides free, high-quality, home-away-from-home accommodations and support services to families of hospitalized children in the United Kingdom. London employees participated in a Tough Mudder event to raise £3,288 (about $4,200) for the trust. ArgoGlobal proudly served as title sponsor of All Out for Cricket, a tournament that raises money for The Sick Children’s Trust. The UK charity provides accommodation for families while their seriously ill children receive care. This year’s tournament raised a record-breaking £81,352. 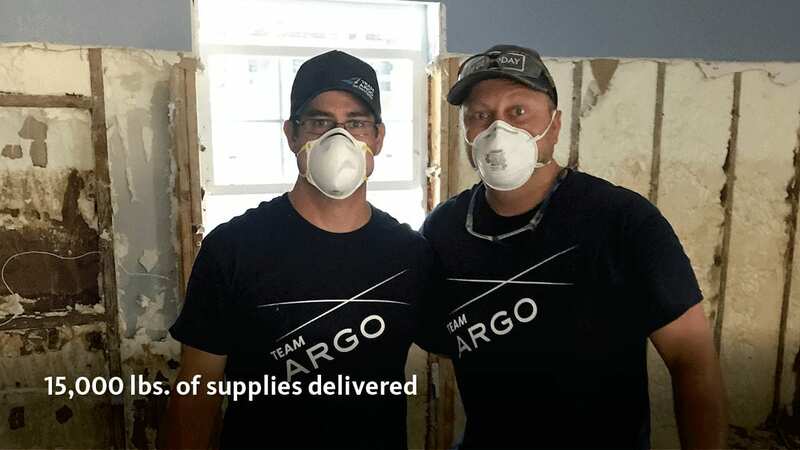 It didn’t take long for Argo employees to swing into action after Hurricane Harvey smashed the Texas coast in late August. For some, that meant weeks of demolition and cleanup work at more than a dozen homes. Other Argo employees volunteered at area shelters, laundered clothes and made meals for first responders and displaced families. In addition to their time and labor, Argo employees donated and delivered over 15,000 pounds of supplies. Read more. Chalk It Up drew representatives from nonprofit organizations, international corporations and more than 50 schools to downtown San Antonio. The free event had everything from freestyle chalk drawings and clothesline-hung haikus to multimedia installations. This year was the first with a competition between participating sponsors, and Argo took home the top prize for their piece celebrating the Formula E Dragon Racing sponsorship. Watch the 360 video. 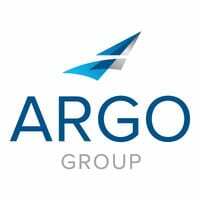 For 11 years, Argo Group has partnered with the nonprofit Family Service Association – San Antonio’s oldest human service agency – to help ensure families have a delicious meal with all the trimmings on Thanksgiving. At this year’s Turkey Drive, Argo employees distributed 250 meals to families in need. Think you’re safe online? Test your knowledge with a quick quiz.